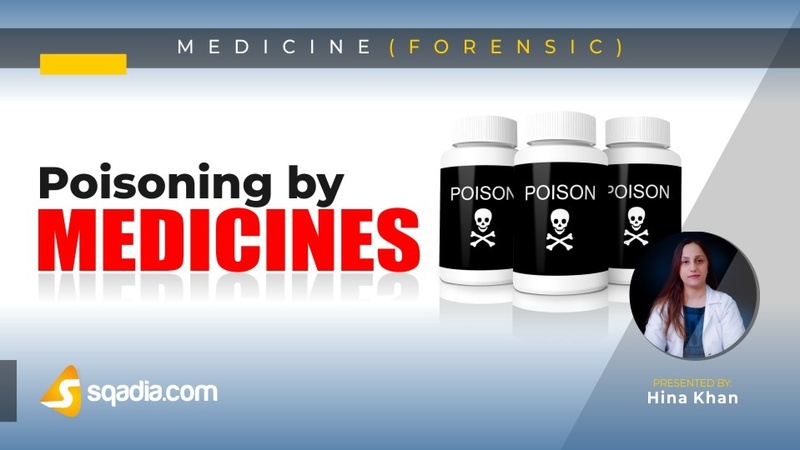 This sqadia medical lecture of Forensic medicine brings under discussion poisoning by medicines. Medications hold a therapeutic significance. However, the increased dosage results in poisoning. This causes a range of effects which make autopsy investigations difficult. Poisoning can occur due to a range of drugs which can be analgesics, anxiolytics, antidepressants, opioids, amphetamine and cocaine. Each one of these has characteristic features and autopsy findings for these vary remarkably from each other. 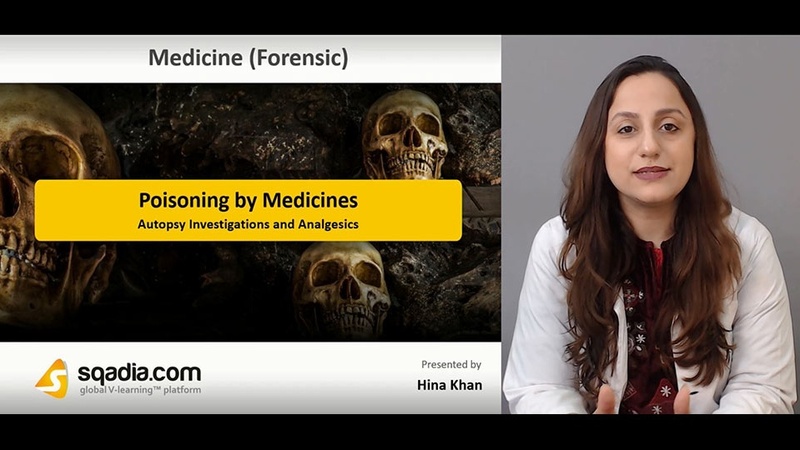 The autopsy investigations and analgesics in poisoning by medicines is also discussed in this medical lecture. In a forensic scene, poisoning owing to certain medicines, calls for autopsy investigations. This appraisal is quite difficult owing to lack of characteristics autopsy features. Various technical assays are carried out for both the qualitative and quantitative analysis. Analgesic drugs, pain-relivers, like aspirin and salicylates can cause self-poisoning. Autopsy findings of this drug includes gross abnormalities in addition to vomiting and some rare haemorrhagic manifestations. This, however, leads to certain internal complications as well. Moreover, paracetamol proves to be potentially lethal at overdosage of 20 grams. Autopsy findings of this analgesic demonstrate hepatomegaly, yellow skin discoloration and myocardial damage. For the better understanding of medical students, in depth elaboration is given on anxiolytics and antidepressants. Poisoning can be attributed to by certain anxiolytic and antidepressant drugs as well. This has been extensively been discussed in a video medical lecture at our platform sqadia.com. Antidepressants include tricyclic, tetracyclic antidepressants and monoamine oxidase (MAO) inhibitors. Benzodiazepines, a group of anti-anxiety drugs, pose certain tranquillizing effects. They vary in range from long (flurazepam) to intermediate (loprazolam) and short (triazolam) acting. In addition to these, other class of anxiolytic drugs are the phenothiazines and barbiturates. The former presents with non-specific appearances while the later demonstrate signs of cardiorespiratory failure, cyanosis and congested lungs. Besides these, poisoning is likely to occur due to insulin as well. At autopsy, this shows findings of needle marks. For MBBS students, detailed explanation of opioid drugs is delivered under the lecture title poisoning by medicines. Poisoning ascribable to opioid drugs is also a reality. Autopsy appearances from opioids indicate injection marks in addition to skin popping and body emaciation. However, toxicological analysis portrays that measurement of exact drug concentration after death is quite difficult. Methadone, Hallucinogens and phencyclidine are a few examples. Death pertaining to methadone is due to intolerance. Nevertheless, hallucinogens are the primary cause of death for which autopsy findings are either negative or solely non-specific. Last category called phencyclidine causes complications like hyperthermia, intracranial haemorrhage and cardiac failure. Amphetamine and cocaine is discussed comprehensively in the medical video lecture at the platform of sqadia.com for medical and MBBS students. Amphetamine and cocaine are also responsible for poisoning. Lysergic Acid Diethylamide, a powerful hallucinogenic, is not lethal. Cannabis has six active components and its ingestion is indicated from swabs and urine and blood analysis. Amphetamine, however, show no specific findings. Another drug called ecstasy does not demonstrate autopsy signs apart from marked cyanotic congestive state. On the other hand, cocaine has multi-organ effects. It presents with no specific features and can be found as micro emboli.